Last week Cincinnati City Council approved its yearly budget for the coming fiscal year. The approved budget lays out several city priorities for funding redevelopment efforts in many of the city’s 52 neighborhoods. “This budget prioritizes our neighborhoods and will improve our economic competitiveness, make the city safer and healthier, protect our citizens who are most in need, and support our world class parks and arts,” Cincinnati Vice Mayor Roxanne Qualls (C) stated in a prepared release. City officials say the increased funding will go towards two programs that are designed to maximize impacts on neighborhoods throughout the city. 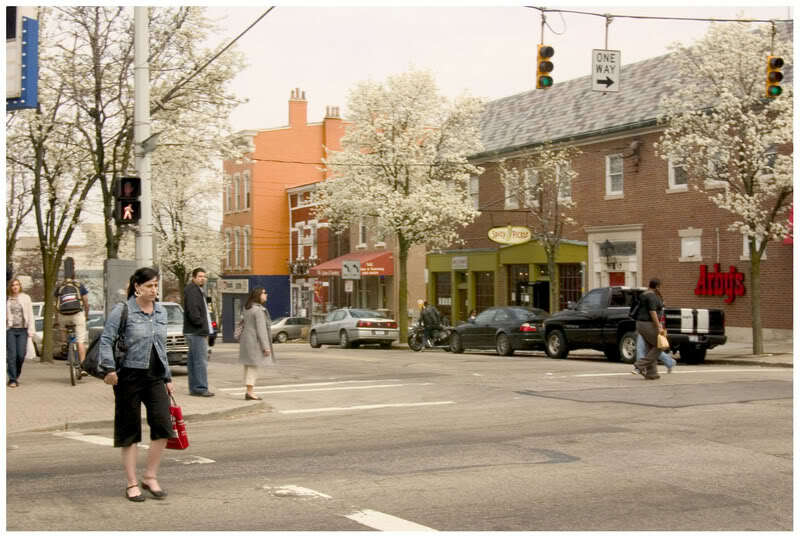 Cincinnati’s new budget directs funding towards the city’s 52 neighborhoods and invests in walkable neighborhood districts like Calhoun/McMillan in Clifton Heights (above). Photograph by Randy Simes for UrbanCincy. The first program creates a new fund called Focus 52, which will create a pool of $54 million designed to focus on neighborhood projects by utilizing strategies developed from the city’s successes in the urban core. “This budget will take the lessons we’ve learned from our success in downtown and Over-the-Rhine redevelopment and give our neighborhoods the support to take that momentum into their communities,” Qualls continued. The second program endorses 13 neighborhood enhancement projects in neighborhoods such as Avondale, Walnut Hills, Mt. Adams and Price Hill. The annual funding for these projects comes from the Neighborhood Business District Improvement Program (NBDIP), which was created in partnership between the City’s Economic Development Division and the Cincinnati Neighborhood Business Districts United. This commitment to city neighborhoods was recently outlined in the city’s recently adopted comprehensive plan, Plan Cincinnati. Several of the goals outlined in the new plan focus heavily on the continued development of the city’s traditional walkable neighborhood centers. The plan outlines over 40 different centers outside of downtown and calls for the assessment of neighborhood needs and the rehabilitation of neighborhood centers by utilizing tools such as the city’s new form-based code. Working to begin the implementation of this new plan Vice Mayor Qualls has directed staff to identify sources of capital funding to begin accomplishing some of the plans goals.